September 2013 Write Angles	See you Sunday! We’re all very excited to get together again after our summer break. At 2pm, Brooke Warner will talk about getting our platforms polished, but there’s a lot of other club activity tomorrow, too! At 10am, the Executive Board will meet at Lake Chalet. Please come if you would like to join the board. We are desperately in need of a treasurer or co-treasurer, and a membership co-chair. At 12pm, anyone interested in making our meetings sizzle should join us for a bite to eat at the Blue Oak café in the Oakland Museum (no admission needed.) Please come if you anticipate coming to 3-4 meetings in the upcoming year. At 1pm, our Marketing Group reunites in the community room at the Library. Please come if you are a member with a book to sell! 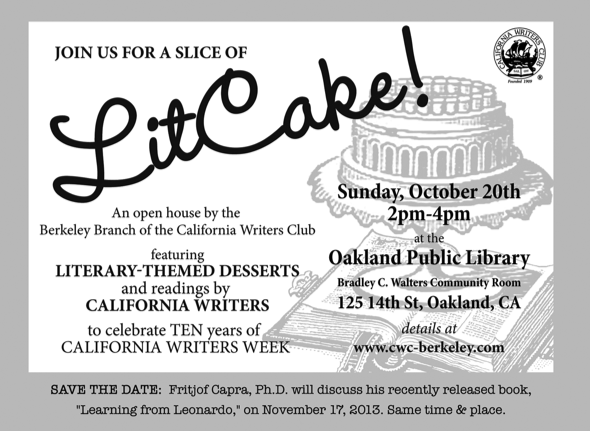 And finally, after Ms. Warner’s presentation, there will be a brief meeting to plan NEXT MONTH’S special event, LitCake! This open house/social will be like a LitQuake “afterparty” hosted by our writing club, and will bring back some of the fun we had this summer at our annual picnic. And YES, you read that right. Our November speaker is the legendary Fritjof Capra! Stay tuned for more news. Es un alivio encontrar a alguien que realmente sabe lo que están hablando en la red . Con seguridad, que sabes cómo llevar un post a la luz y que sea didáctico. Más personas tiene que leer esto.